The holidays are just around the corner, and if you’re like most homemakers, you’re probably thinking of how to make your celebrations extra fun and memorable for your loved ones this year. Mom bloggers Anne, Kris, and Isha, all known for their housekeeping and other practical tips, are one in saying that planning is important so that you can be ready for the whirlwind of activities that come with the holiday season. A hardworking smartphone and data plan. Share your holiday adventures by taking lots and lots of photos. Make sure your smartphone has a good camera and plenty of storage so that you can take all the photos you want – from the food you served to the selfies and groufies you’ll have with the family and friends. Upload your photos quickly on social media so that everyone can partake of the fun, even virtually. Healthy food. With all the partying going around, some people may overindulge and break their doctors’ orders. To make sure that even those who are on a diet or have special medical considerations also get to enjoy the holiday feast, have something prepared especially for them. Fruits and vegetables are always be good to have and are healthy for you too. Christmas-themed décor. To evoke that holiday feel, make it a white Christmas! The mom bloggers all agree that white is in this Christmas. Have some white table runners and white napkins for a wintery look. While you’re at it, bring out your white pillow cases and throw pillows as well, and combine them with reds and golds. You can have a holiday wonderland right in your own home. Extra gifts. The last thing you want to happen is to find out you forgot to put someone in your Christmas gift list. Since you can’t really tell who this person will be and when you’ll need the item, prepare one or two gifts that you can easily pull out anytime. Some ideas would be plain white shirts (one size fits all), white hankies, and face towels. Holiday frocks. You want your family members to have the right holiday gear so that they can be comfortable yet presentable in the rush of holiday activities. When choosing clothes, go for classic colors such as white, which is easy to mix with just about anything and never goes out of style. Just because your family members haven’t worn some clothes for a long time doesn’t mean you should throw them away. By using a deep cleaning detergent with intensive cleaning power, putim shirts can be brilliant white again, just in time for the holidays. Our blogger moms all swear by Tide, whose intensive cleaning power keeps clothes so white that they actually look new. Enjoy white clothes you’ve always loved, as well as those lovely colors you enjoy, by using detergents that have been especially formulated to bring out your clothes’ whiteness. 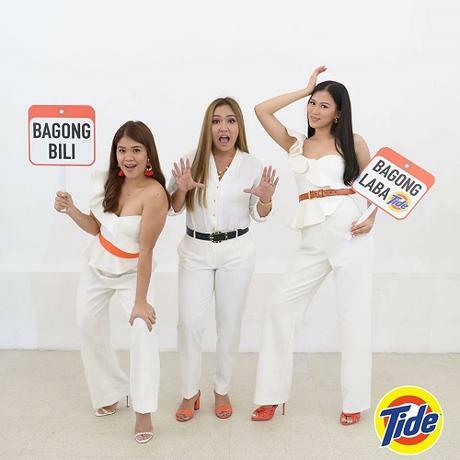 Just like Melai and Alex Gonzaga who kept everyone guessing who among them was wearing BagongBili o BagongLaba with Tide, the mommy bloggers noted that despite repeated usage, clothes washed with Tide look new. “Sobrang amazing ang Tide! Ang dating luma, mukhang bago sa kaputian. Gumamit kayo ng Tide para hindi na kailangan bumili ng bago,” says mom Isha. “Filipino moms are practical, so we are happy to bring them Tide, which allows them to keep their families’ clothes looking and smelling new. At the same time, they are able to save money by not having to replace clothes so often,” ends Procter & Gamble’s Country Marketing Manager for Laundry, Jonn Terence Dy. With Tide, white is in. “Kikinang-kinang ang damit nyo sa kaputian ngayong Pasko,” concludes Mommy Anne.